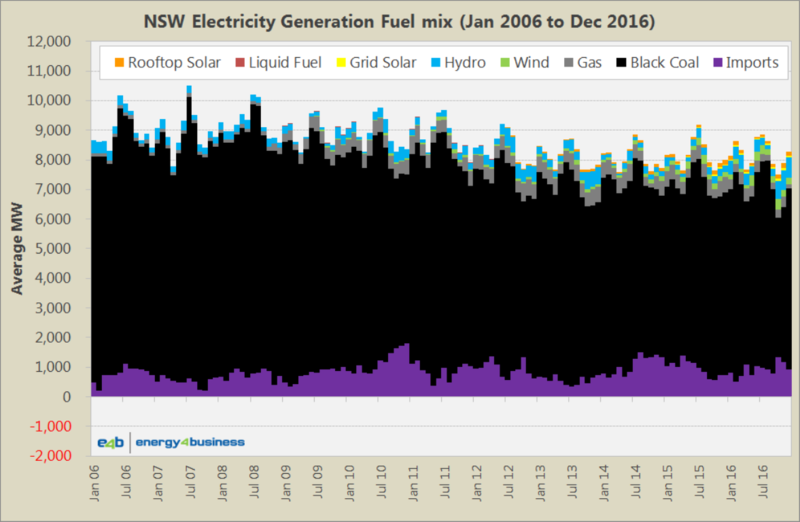 Australia’s power generation mix continues to evolve. Natural gas fired generation for the remaining 6%. Renewable generation now supplies 8% of the market with 2.5% from solar and 5.5% from wind. However, the power generation fuel mix varies significantly by region. Tasmania remains the standout as the state with the lowest carbon emissions intensity of all NEM regions, largely due to its hydro-electric resource endowment. However, the state that has experienced the greatest green transition is South Australia. 2007 saw the appearance and rapid growth of electricity generation from wind farms in South Australia. Wind farm generation up to 33%. 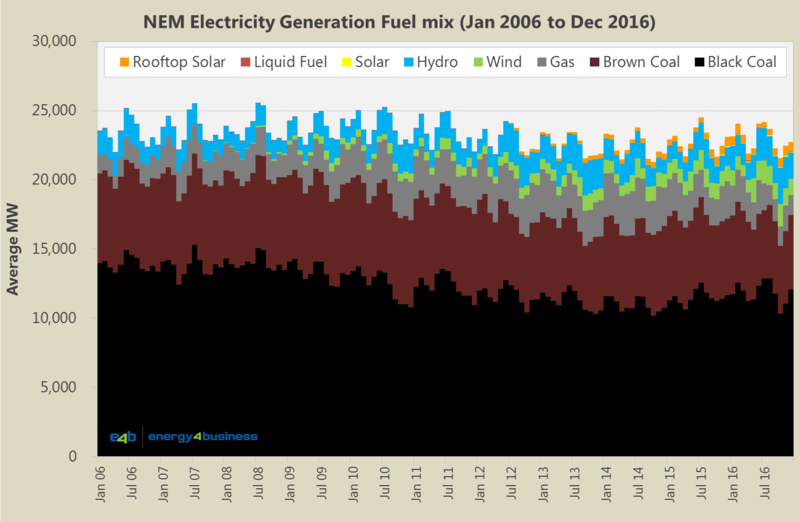 South Australia is now the only mainland NEM state without any coal-fired power generation, following the closure of the Leigh Creek Coal Mine in November 2015 and the Northern & Playford Power Stations at Port Augusta in May 2016. As at December 2016, the carbon intensity of SA’s power generation sector is 0.3 tonnes of carbon dioxide equivalent per megawatt hour of electricity (0.3t CO2e/MWh) or approximately one third of the whole NEM average of 0.9t CO2e/MWh. Biomass has picked up almost 1%. 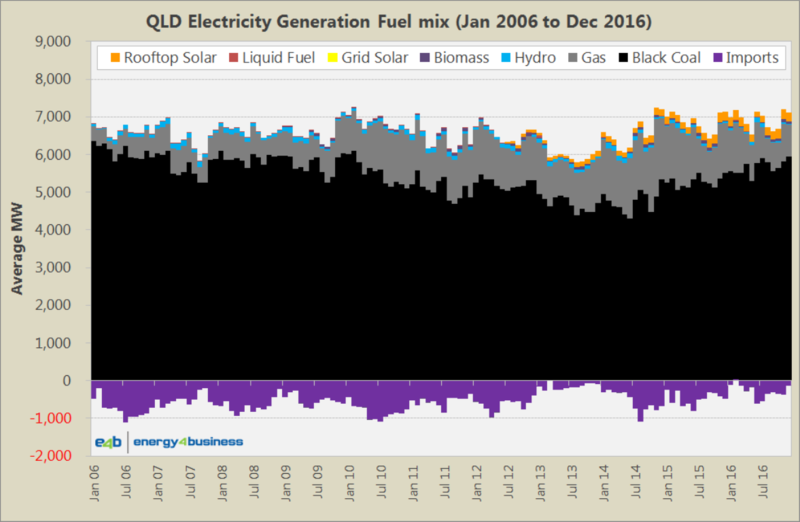 The carbon intensity of QLD’s power generation sector in December 2016 is 0.9t CO2e/MWh on a par with the whole NEM average. Solar PV is now taking 2% share. The carbon intensity of the NSW power generation sector in December 2016 is 0.86t CO2e/MWh which is approximately 4% below the whole NEM average of 0.9t CO2e/MWh. VIC exported 6% of its generation to NSW, TAS & SA. Exports have over doubled to 16%. The carbon intensity of the VIC power generation sector in December 2016 is 1.2t CO2e/MWh or 32% above the whole NEM average of 0.9t CO2e/MWh. Tasmania’s electricity supply remains dominated by hydro-electric power and switches between net imports and net exports with VIC. 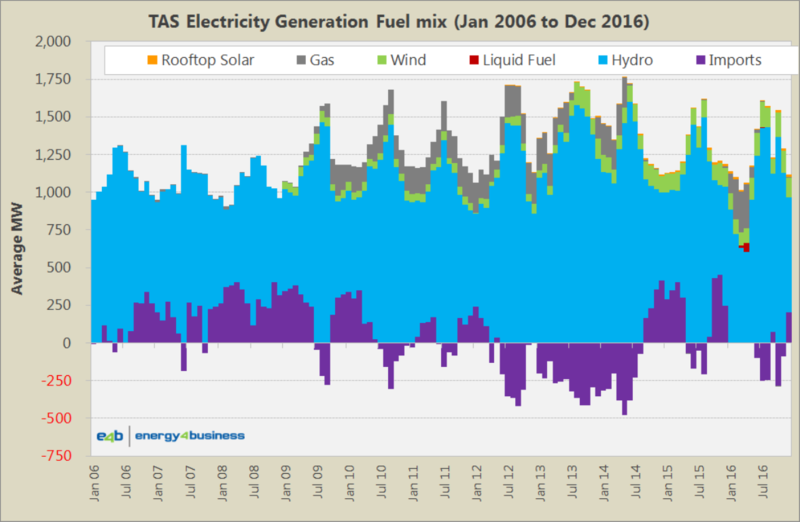 Wind is also increasing its share in TAS. TAS is interconnected to VIC, and in the earlier part of the past decade TAS was a net importer from VIC. During the 2 years of the carbon tax, TAS was exclusively a net exporter to VIC on a monthly basis. In the first half of 2016 there were no imports to, or exports from, TAS due to the outage of the Basslink interconnector between VIC & TAS. Imports from VIC for 10%. TAS was a 5% next exporter over the year. The carbon intensity of the TAS power generation sector in December 2016 was 0.0t CO2e/MWh compared to the whole NEM of 0.9t CO2e/MWh. 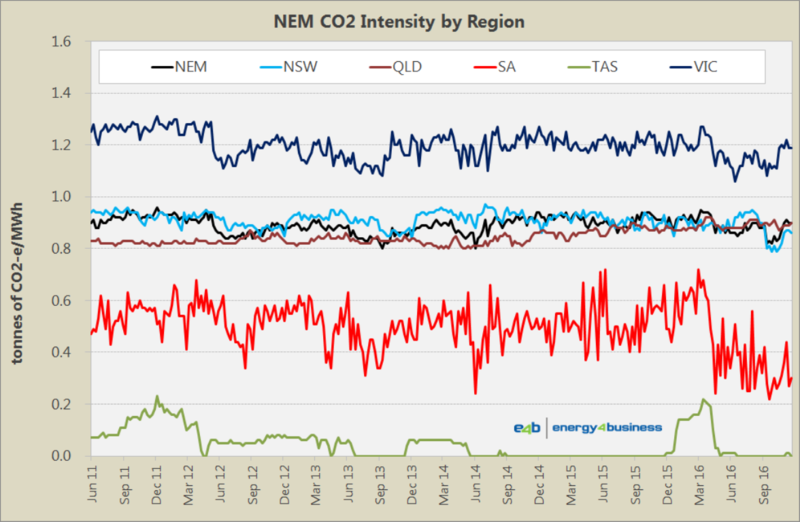 The following chart shows the weekly CO2 emissions reported by AEMO by NEM region from June 2011. TAS has the lowest emissions at close to zero, but had average levels around 1.3 tonnes CO2e/MWh during the Basslink outage in the first half of 2016. 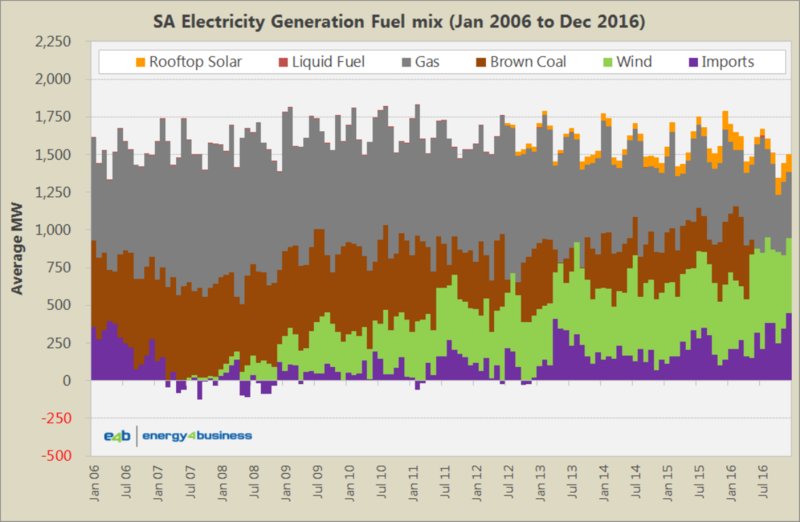 SA’s average emissions intensity has fallen 35% from 0.52 to 0.34 following the closure of the Augusta Power Stations in May 2016. NSW & QLD emissions remain at similar levels to the NEM average. 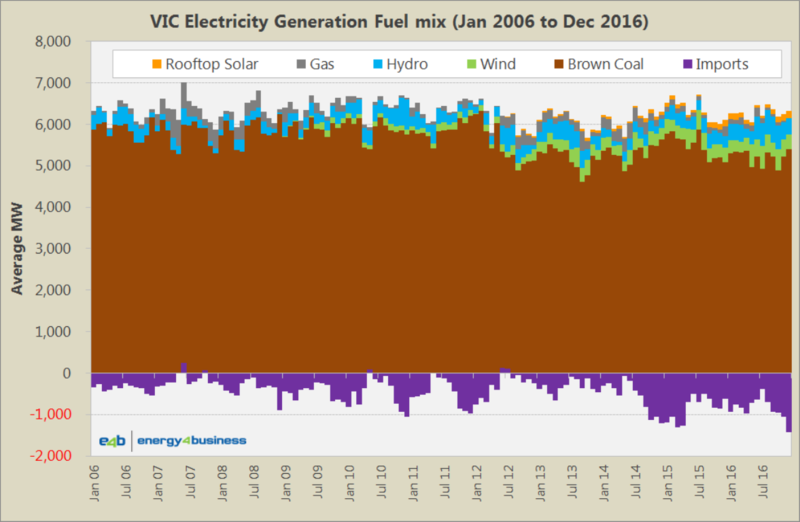 VIC emissions remain at approximately 32% above the NEM average.